Star vehicles aren't nearly as common as they used to be but you'll still see them come out at least several times a year. 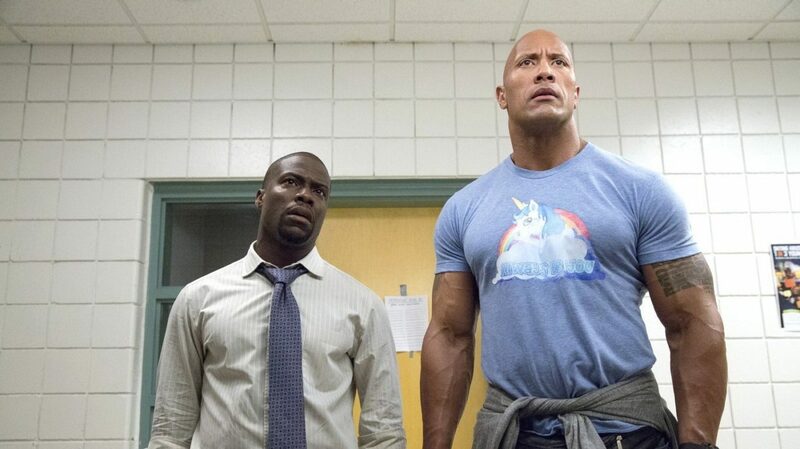 But Central Intelligence is another thing altogether than just a star vehicle - it's not a project that has been designed to take best advantage of the established skills and personae of Kevin Hart (one of the most reliably bankable movie stars in the American film industry right now) and Dwayne Johnson (who's not that far behind Hart). It's not, frankly a project that appears to have been designed at all, but simply a basket of plot points from every cop movie since the 1980s spilled over onto a table, with a handful picked up at random. It's not so much that it's a bad movie, as that it's almost a non-movie: bland, connect-the-dots screenwriting, drab shots. The fact that the editing is, at times, a bit irritatingly high-paced and joke-squashing is the closest I can come to an active opinion on its merits as a cinematic object or storytelling device. And yet it's an absolute delight, and it is a delight for the solitary reason that Hart and Johnson make it so. This is the best exemplar of an old-school movie star picture in ages: a throwback to the '30s and '40s when the breakneck pace of Hollywood film production meant that you'd simply get a lot of movies where there wasn't time to do anything more than just make them, make them as competent and coherent as could could be reasonably arranged, but no more. And that's where the stars came in: you have a nothing script made with no artistry, but the mere fact that we get to spend 80 minutes with an actor whose strong personality and ability to hold the camera's attention makes it an enjoyable, even gratifying prospect. I make absolutely no claims that Central Intelligence is a good movie, and I have strong doubts that it will turn out to be a memorable movie: but it is an enjoyable movie - I do not know if there's been another 2016 release that I enjoyed more than this, more consistently, and with less effort. The notional hook is that Johnson plays a CIA agent who went to high school with Hart's character, and now needs him to help with a case; in this case, the hook is a poor explanation for what the thing is. I mean, all of that is true, but misleading. The actual hook is that Johnson's Bob Stone, né Robbie Wheirdicht,* used to be an overweight nerd, and has carried around for 20 years the memory that Hart's Calvin Joyner was kind to him in his moment of greatest social embarrassment. And now, despite being insanely well-built and badass, Bob is still exactly the same goofy nerd who loves unicorns, and still looks up to Calvin with awestruck hero worship, even as Calvin has a bitterly impersonal job as a midlevel executive at a corporate accounting firm and hates his life. The hook, in other words, is not "badass The Rock and goofy Kevin Hart are spies", which would make this Ride Along with a different straight man to play against Hart. The hook is that Hart is the straight man, while Johnson is the wacky clown geeking out at getting to introduce his lifelong idol to the exciting world of exposing CIA corruption. It's a conceit that pays off splendidly: this is in some ways the culmination to Johnson's steady climb to being a reliable comic character actor for most of the last ten years. It makes sense, and always has: if we allow that comedy is, by its nature, an act of unexpected juxtapositions, Johnson is sort of the walking embodiment of that. He's a giant mountain of a man who looks like he could tear a car in half, and yet increasingly his screen appearances foreground his utterly beguiling enthusiasm for seemingly everything in the whole world. Bob Stone is the logical extension of that, a character whose first act is to joyously and confidently lip-synch and dance, who chatters about unicorns and pop songs and how very cool it is to be an action hero in an action movie. It's not, probably, Johnson's best performance, but it doesn't have to be - it's a star giving us what he's great at doing, not surprising or challenging our expectations so much as completely and in every way living up to them. It's Hart, actually, who ends up working himself: his cinematic career to this point has been dominated by agitated men who are neurotic about their diminutive size and full of manic self-confidence as a defense mechanism, and there's at least a scene or two of that in Central Intelligence. But surprisingly, Hart is mostly content to let Johnson have the jokes while he builds a character, layering in a basic but effective amount of self-doubt and regret, while playing his character's generally dubious fear of the situation he's involved in as the reasonable worry of a normal man and audience identification character, rather than outside cowardice. He is, basically, playing Cary Grant's character in Bringing Up Baby or John Barrymore in Twentieth Century to Johnson's liberated, rejuvenating, "damn the consequences" madcap, in a screwball bromantic comedy. All of which is well and good - well and great, even; the fact that a film could be made even theoretically, let alone was actually made in practice, that has made me excited for Kevin Hart again is a miracle. That being said, Central Intelligence is still a hard movie to go to bat for; outside of the pleasure of Johnson turning his comic side up full blast and watching Hart complicate his stock character, the film offers pretty much nothing. The story is a trite mess, in which Bob is tracking down a CIA mole, while also dodging the CIA, who thinks he is the mole (the film actually tires to make us wonder, along with Calvin, if he might actually be guilty; as though Dwayne Johnson would turn out to be the bad guy in a Dwayne Johnson comedy); meanwhile, Calvin is going through a rough patch with his wife Maggie (Danielle Nicolet), which isn't nearly as sticky as it could be (it feels more of a piece with the rest of the movie than the similar scenes in the Ride Along s), but still offers the film basically nothing. You can predict damn near the whole movie basically from the moment the plot reveals itself, which comes fairly late: the entire first act is nothing but Johnson and Hart bouncing off of each other, with none of the vanilla action scenes or spy intrigue of the last hour-plus, and it is for this reason that the first act is the most enjoyable and rewarding part of the film. Director and co-writer Rawson Marshall Thurber has no obvious acumen for making a thriller, which means that the more that this comedy tends towards its CIA plot, the harder it is to care. The inclusion of the overqualified Amy Ryan as the CIA agent hunting Bob at least adds some texture - it appears that Ryan was enjoying herself on set - but we don't really need another film that teases us with Amy Ryan and then does essentially nothing with her, at this point in time. In other words: your film year is complete without seeing Central Intelligence. But I would absolutely not counsel against doing so. There's something refreshing, infinitely so, about a movie whose sole appeal is "you will like spending time with these people, and basking in their movie star glow", even if it's tarted up with too many wan action scenes and a bum third act. It is a fun movie with no other intentions - always a risk, given easy it is for such exercises to turn out to be no fun at all, and thus tedious. But Johnson's magnetic screen presence, and his easy repartee with Hart, are quite sufficient for a summertime matinee.